I AM A STAY AT HOME MOM!!! It's hit me in the last day that I really am not going back to work, that this isn't just a vacation, and guess what... it's AWESOME! I wrote that I was a bit out of commission for a few days because I was in a lot of pain with my back, but it started feeling much better yesterday. I am feeling so much more joyful and energized. I was looking forward to Hunter's naptime and bedtime a lot while my back was hurting. Today, right now, I am totally missing my little man while he's taking his nap. I just adore that kid and I feel like the luckiest and most blessed mama ever that I get to spend everyday with such a fun and easy little guy. He was so cute yesterday afternoon. He woke up from his nap and was on the search for his Little People "farmer" that sits in the tractor. He couldn't find it anywhere. He sadly said "Mommy, farmer gone. In car?" So I went out to the car three seperate times to find farmer. No such luck. He wasn't in the playroom, Hunter's room, or in the living room. When I told Hunter that he was really gone, he just turned around and sat in his little chair and put his head down and said "Hunter miss farmer". It was the cutest and saddest thing ever. And then I thought, let's just go find a new one! This is when it really hit me that I am a stay at home mom. There would be no way that I would have driven to Toys R Us on a weeknight to go on a search for a toy. But now I have so much energy and am so stressfree. So, we went to the store and I quickly realized that "farmer" is part of a $40 barn set. Ugh. But then Hunter saw a Little People "cook" and exclaimed "Farmer!!" and it was only $6, perfect! We got in the car and I took farmer out of the package and into the tractor that was waiting in the car. Hunter was the happiest little boy ever when I handed it to him! 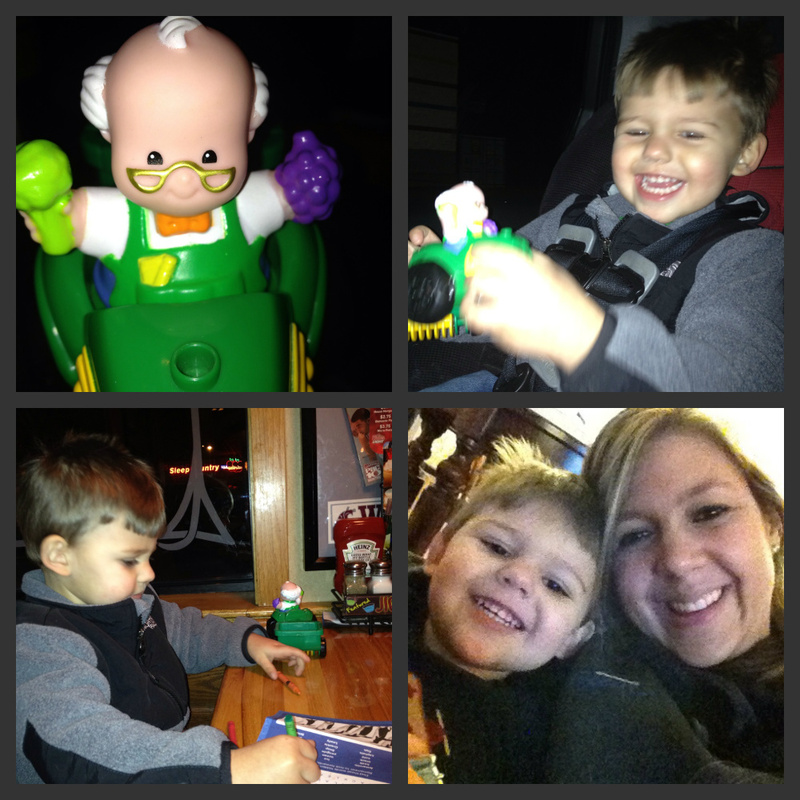 Afterwards, I took Hunter to Applebee's for a little dinner date with my favorite little guy. He sat next to me and played with his farmer and tractor with such content. Then we went home and watched Cars. My heart just about exploded with love last night in realizing that this is my new life. I love it! I love this! That is such a cute story about Farmer and I'm glad he likes the cook like he likes Farmer. Best part of this post is hearing how joyful and carefree you are. That is awesome!! I occasionally have days where I am in countdown to Judahs nap, its mainly from stomach issues or my tooth (where the dentist messed up) and I have to wait till my husband is back in town so I can get it fixed. But as soon as he goes down I miss him and I want to cuddle.